Recently I was given the opportunity to check out a product from Go7Gaming. 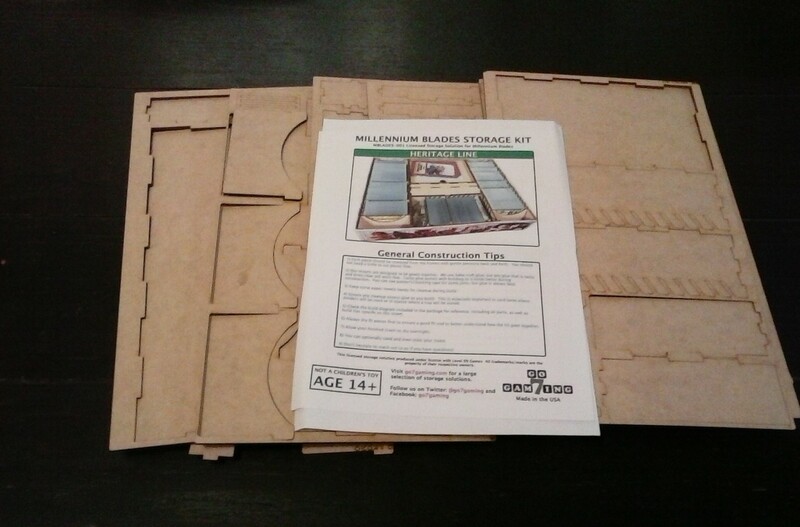 That product was the Millennium Blades Storage Solution. I received it in a flat rate shipping package. Inside I found a bundle of wooden sheets wrapped together in a large ziplock bag with some full color instructions explaining how to put everything together. After removing the sheets from the packaging and reading through the instructions, it was ready to assemble. Now then, let me explain exactly what this product is and what it does. First off, this is an insert for the game Millennium Blades. 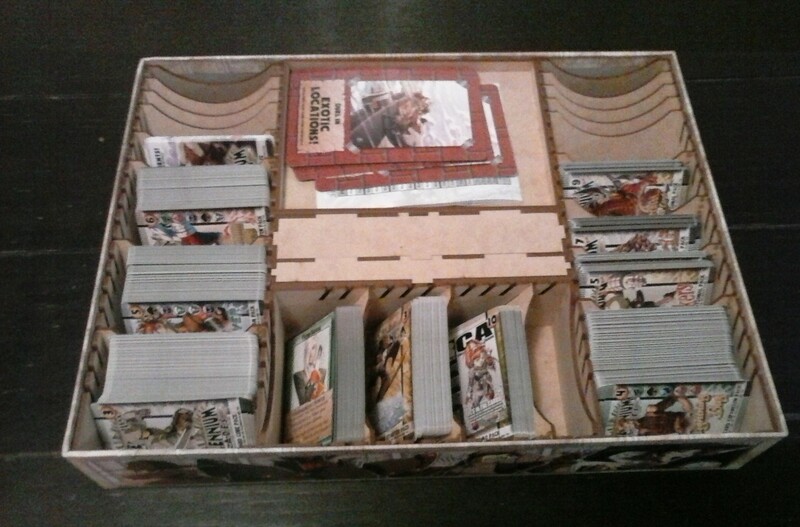 Once it’s assembled, the insert will make it possible to keep all the many parts and pieces of the Millennium Blades game organized as well as all the different types of cards. There will even be room for expansions and promos, as you’ll be able to see in just a little bit. 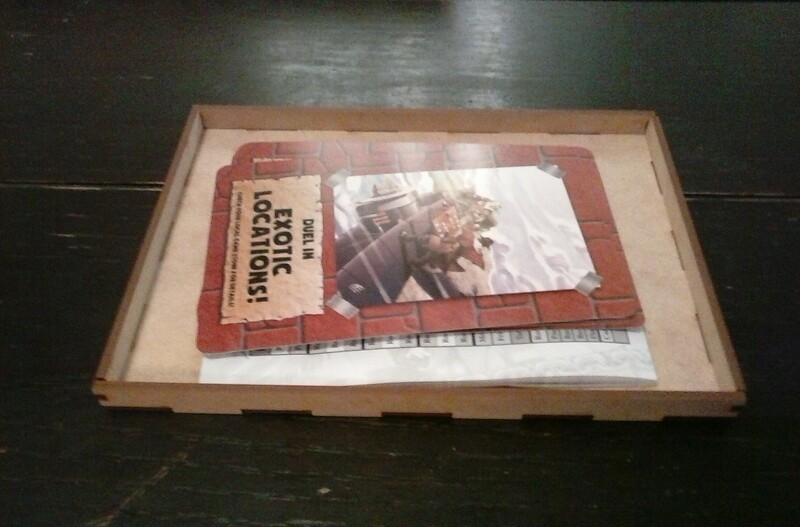 The insert looks amazing and really fits well inside the box. But I’m getting ahead of myself, so let’s get right to it. Let’s take a look at everything you get and the basic assembly of the insert. We’ll start off with separating out all the different wooden sheets. As you can tell, there are quite a few of them. Each piece is cut so that you can easily punch them out from the main sheet that they’re attached to. So from the first thing that you’re gonna want to do is get some glue. No joke, get some. You’ll need it. The first insert that I tried putting together without glue didn’t go so well. It became quickly apparent at that time that glue is a necessity. In this review I’m not going to lay it out there when to glue a piece. Just understand that if you’re putting 2 pieces together, you’re gonna want to glue them both. Simple rule of thumb. Got it? Good. Moving on. So the first thing that you’ll want to do is build the small card storage stray. The instructions will show you what pieces that you’ll need and which sheet they’re located on. Once you’ve got the right ones, simply put the 2 long sides and 2 short sides together with the base. Oh and make sure that you put the slots running in the same direction. I almost messed this up when I was doing it. When you’re finished, it’ll look like this. Set it aside and let’s move to the cash caddy/storage tray. This part will hold all of your monopoly looking money that the game comes with. So first you’re gonna need the base plate. Make sure that you have the side with the 1, 5 and 10 logos on it face up. Check the instructions for the proper pieces that you need and then start by putting the 2 center sections in. You’ll then place the back wall on, followed by the 2 sides. When you’re finished, you’ll have something that looks like this. Set this part aside and move on to the shallow storage tray. 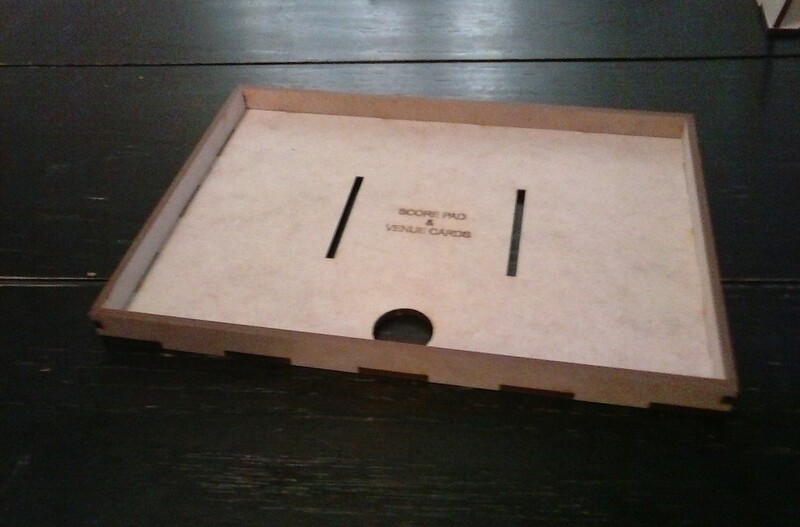 This tray holds the scorepad and the oversized location cards. Once again, you’ll need to start off with the base plate. Make sure that the side with the writing on it is face up. Make sure that you have the correct wall pieces and then attach them around the base. When you’re finished, it’ll look like this. Set it aside and we’ll move on to the shallow token storage tray. This tray holds the skill markers and wooden cubes. Once more you’ll need the correct base plate. Place it with the writing side face up. You’ll then need to attach the middle divider piece. From there you’ll attach the end walls followed by the two longer side walls. The tabs will actually insert into the end pieces. You also need to make sure that the 4 small notches on the underside of the tray have no glue present as you’ll be stacking this tray with one of the other trays inside the box. When you’re done, you’ll have something that looks like this. Set aside the tray and let’s move to the next tray to assemble, the deep token storage tray. 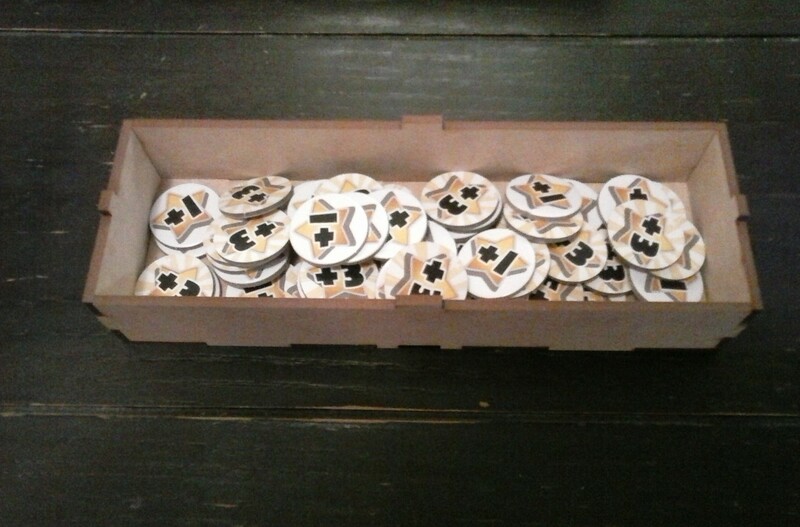 This tray holds the star rating tokens. One more time, you’ll need the correct base plate. Place it with the star side face up. You’ll attache one of the long side walls, followed by the two end pieces. Finally you’ll connect the other long side wall. Once more, make sure that there is no glue present in the 4 small notches on the underside of the tray. 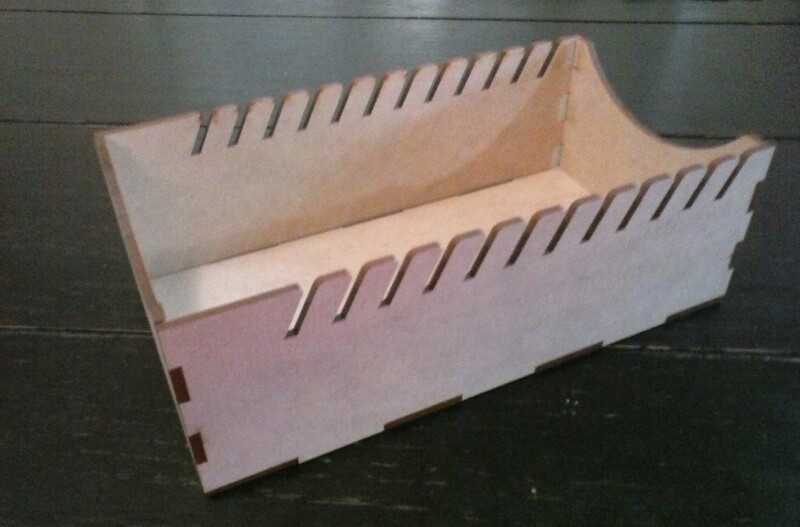 This one will be connected with the skill marker tray. When you’re finished, it should look like this. 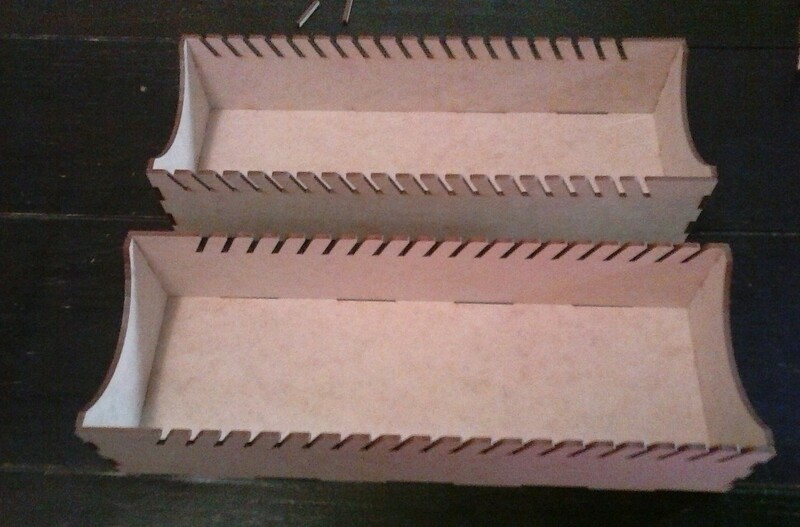 Set aside the tray and we now move to the final two trays, the 2 large card storage trays. Like with the small card storage tray, make sure that as you’re assembling these that the slots are going in the same direction. You’ll need a base for each of the 2 trays. Starting with the long side wall, attach the two end pieces. From there you’ll attach the other long side wall. Like I said, check the slots are in the right direction. You’ll then repeat these steps a second time to make the other tray. Once you’re done, you should have 2 trays that look like this. Now then, let all the trays dry overnight and clean up any excess glue or spillage. You do not want anything sticking to your components or cards. Once everything is dry, you can start placing all your stuff inside the trays and into the box. Start by placing one of the large card storage trays inside, followed by the tray for the money along with the small card storage tray. 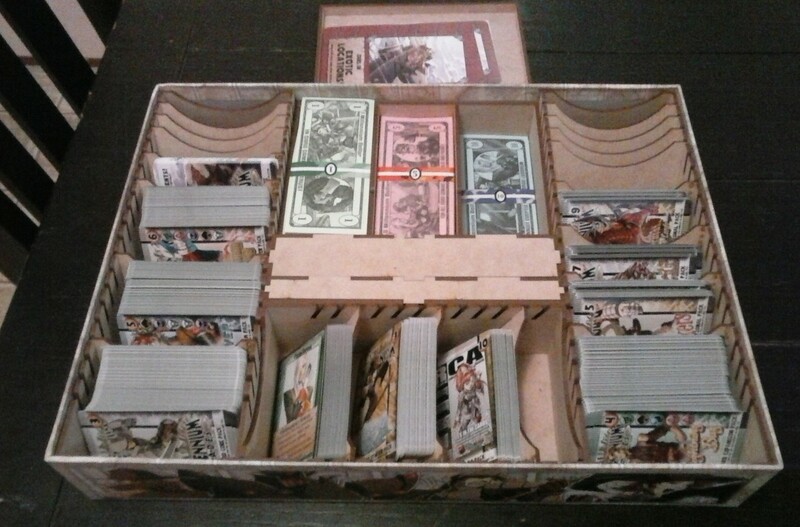 You can then place the other large card storage tray on the other side. 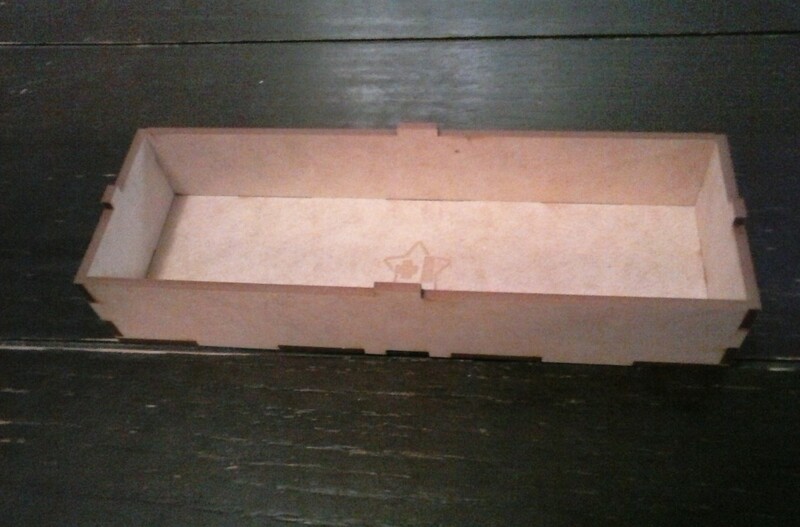 The thinner storage tray for the wooden cubes should be stacked on top of the tray for the star rating tokens. This assembly will then slide between the small card storage tray and the money tray with the small tray facing the small card tray. It just fits better that way. Oh by the way, make sure that you place the lid on the top of the wooden cube tray, or else everything will dump out in the box making a mess. That’s what that lid with the Millennium Blades logo on it is for. Finally you’ll add the tray for the locations and score pad on the top of the money tray. You can access the money by pulling the tray out using the conveniently provided hole. 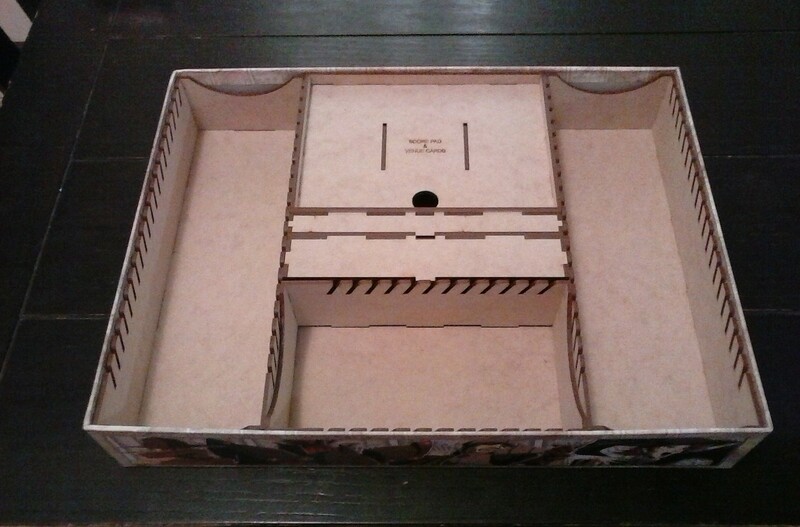 The final thing to do is add all the mats, boards and rules on the top and put the box lid on. You’re done! Here’s what the finished product should end up looking like. In this section I normally describe all the different pieces of the game. Instead, I will describe the packaging and item itself. As I mentioned earlier, everything came in a flat rate shipping package. I’m pleased with how it arrived. Everything was packaged really well with nothing out of place. The cut out pieces were easy to remove. I had no problems taking the pieces free from each sheet of wood. It was really easy to figure out which piece went with which tray as the instruction sheet was really good at showing you where each piece went. Of course you do need to provide your own glue to put it together, maybe even a bit of tape to hold it all together while it dries. In any event, everything went together pretty easily. The glue however is pretty much a necessity otherwise everything falls apart. I highly recommend using glue. Overall the basic materials are excellent. I especially like the imprinted designs on the different tray bases. Grade A. In this section I normally cover the rulebook of the game. Instead I’ll go over the instructions. Included with the materials were 2 pages of instructions in full color. Very nicely done! Everything was written out in a step by step process with pictures included. Everything was laid out really well. I was very happy with the overall lay out and design of the instructions. The different sheets were shown with reference letters for the pieces and then the instructions referenced the letters for ease of assembly. Overall it was pretty easy to figure out what was what. Thanks to the easy instructions, it didn’t take long to put everything together. I’m really pleased and appreciate having instructions that were this good. In this section I normally give my thoughts on how the game is played. Instead I’ll explain the process of assembling the organizer. Pretty much the assembly process was a piece of cake. Everything went together extremely easily. With most inserts and organizers the bases and side pieces fit together really tightly and a lot of the time you have to do some struggling with them to get everything together. That’s not the case with this organizer. 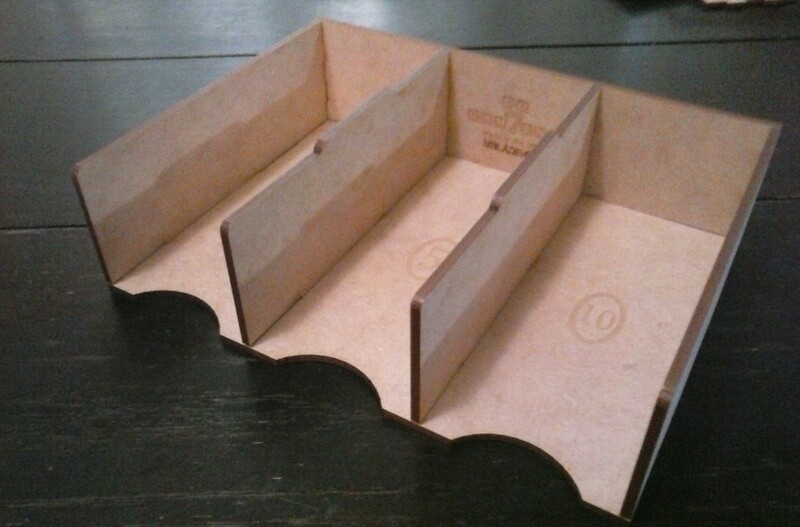 The pieces fit together rather loosely and if you just try to put the trays together without glue, they’ll fall apart. This is why I highly recommend using glue. Once you get everything assembled, you’ll find that there’s plenty of room for expansions and promos. At this moment all I have is the base game from retail so all the parts and cards fit inside very easily. I really like the removable trays as they work out really well for just pulling out and putting on the table. No need to sort stuff out or anything. 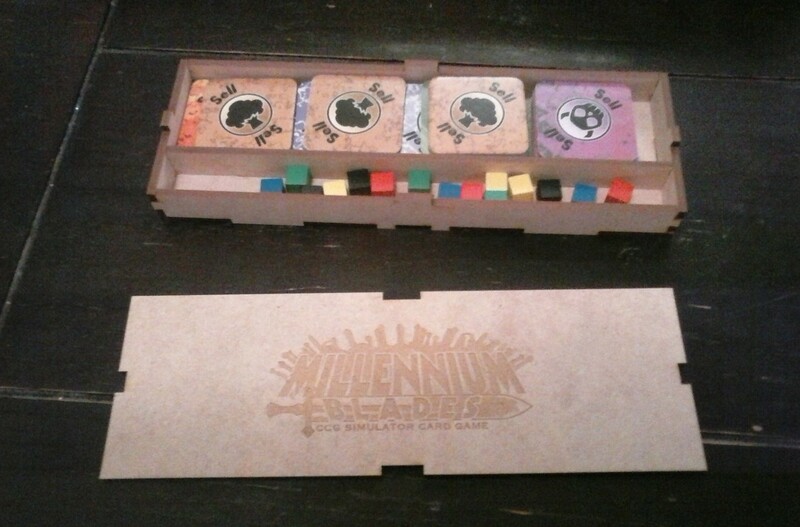 The organizer doesn’t add much weight to the box thankfully as the game itself is large and heavy already. I really like that the lid fit on with no significant bulges or anything. It does seem like when you place the mats and boards in that they’re really close to the top of the box which makes me worry that they might get bent but so far there’s been no issues. Hopefully everything will stay that way. 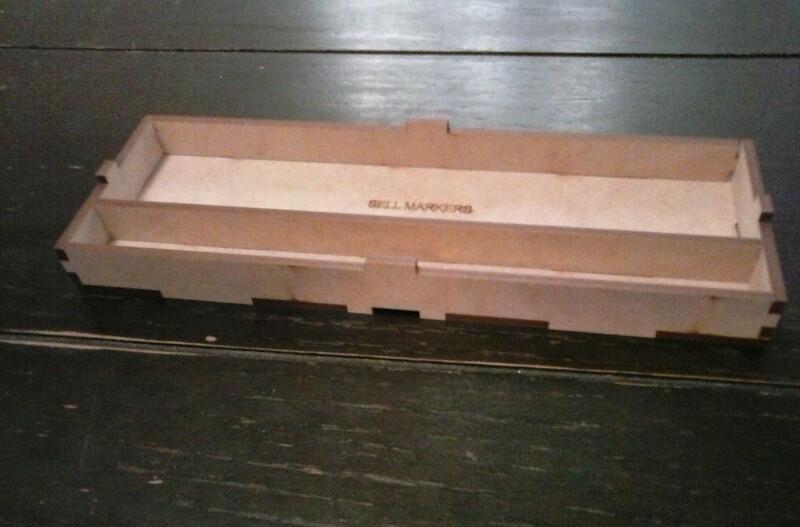 The quality of the wood that the insert is made from is awesome. It’s a little bit thicker than most of the other inserts that I’ve assembled and it appears to be a lot more sturdy as well. There were more card dividers included in the package than I’ll most likely ever need as you can tell from the pictures. However, I’d rather have too many than not enough. I’m sure I’ll find a way to use them eventually. In any event, I’m really pleased with the overall look and functionality of everything. I love the imprinted designs and ease of assembly. It definitely looks and works better than the original cardboard insert. Everything fits great together and looks even better. Overall this is a really great product that Millennium Blade owners most definitely need, whether they know it or not. Excellent! The Go7Gaming Millennium Blades Storage Solution is a piece of sheer craftsmanship. It fits everything you have or will think about purchasing for the Millennium Blades game extremely well. The assembly process was very smooth and easy. Everything went together really well and it all fit the inside the box without any problems. There’s a ton of extra room and card dividers to keep everything organized and in it’s place. I’m pretty sure that this organizer has plenty of room for everything included with the base game as well as the promos and expansion coming out soon too. The instructions were super easy to read and understand. I was able to knock this little project out fairly quickly. Of course you have to let the glue dry but that’s no biggie. Overall the product is really well built and designed. I would highly recommend get yourself one. I’ve said this before and I mean it. If Go7Gaming has an insert for a game that you own, it’s worth your time and money to buy it. You will NOT be disappointed with your purchase. You won’t find better people or products than those at Go7Gaming. Guaranteed. I’m super happy with the product and the experience dealing with the team at Go7Gaming. Grade A! This entry was posted in Reviews and tagged 7, blades, board, board games, card, card games, games, gaming, go, go 7 gaming, go7gaming, insert, millennium, millennium blades, organizer, solution, storage, storage solution. Bookmark the permalink.